To modulate an external hardware device, such as a synthesizer, please follow the steps described in these sections. To modulate an external hardware device, such as a synthesizer, via MIDI CC, please follow the steps described in this section. Mac OS X: use VST plug-in format, since AU plug-ins do not support a direct MIDI out. Insert a new "MIDI Track" and add the MP3244 / SQ4 to the track. Select the MP3244 / SQ4. Configure the MP3244 / SQ4. 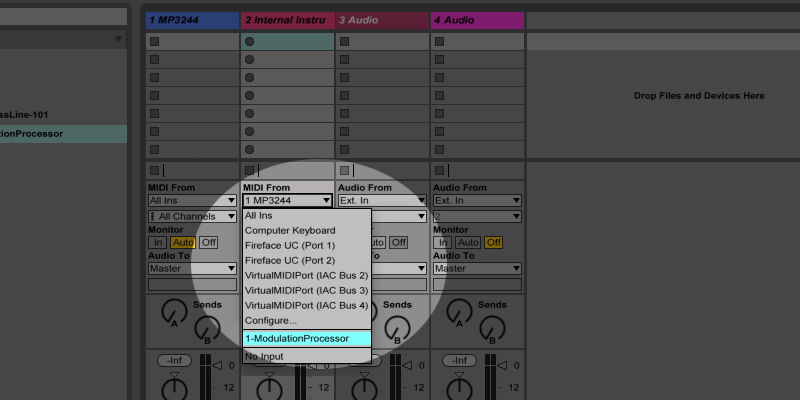 Select "MIDI To Host" on the "Output" section and make sure, that the Format is set to "MIDI CC". Insert a new MIDI track for the external synth and set it up as an "External Instrument". 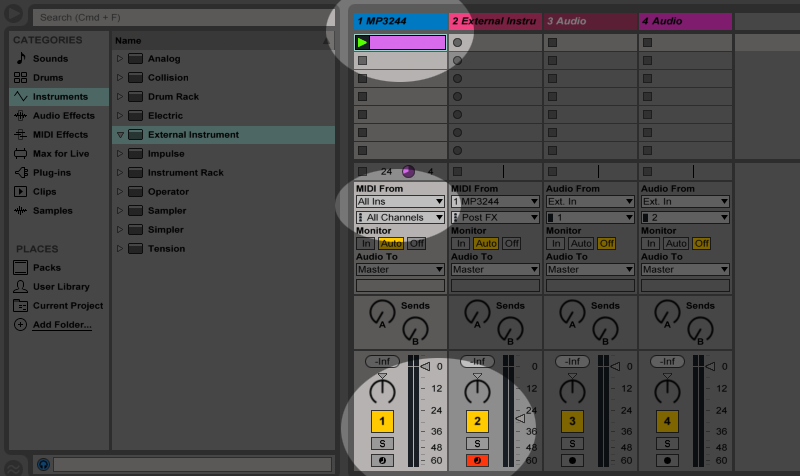 Select your MIDI interface within the "MIDI To" section. Select the MIDI channel where the synthesizer is connected. Set the "MIDI From" on the "External Instrument" track to the MP3244 / SQ4 track to receive MIDI messages for your external synth. All MIDI data (notes) that you record should be on the MP3244 /SQ4 Track. This is needed to trigger the Slope and Envelope Generators. Set the "Input Channel" on the "External Instrument" track to the MP3244 / SQ4 track to receive the MIDI messages from the plug-in. 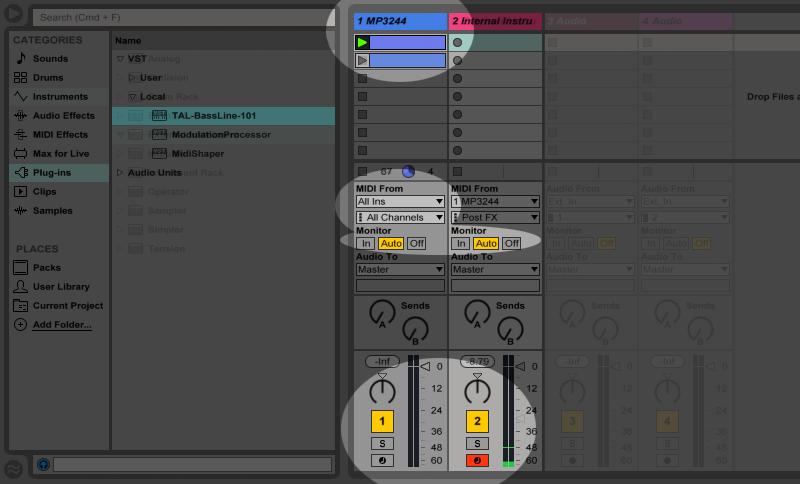 Make sure that you select "Monitor" > "In" or "Arm" both tracks to have the MIDI notes transmitted. Remember to record your MIDI data on the MP3244 / SQ4 track. You may need to set the MIDI input on the MP3244 / SQ4 track according to your setup. This section applies to Mac platforms only. It describes how to setup Live to send MIDI SysEx Messages to an external device. Insert a new "MIDI Track" and add the MP3244 /SQ4 to the track. Select the MP3244 / SQ4. Configure the MP3244 /SQ4. Within the "Output" section select "MIDI SysEx" as "Format" and as "Device" select the MIDI port where your device is connected. To modulate an external hardware device, such as a synthesizer, via Control Voltages, please follow the steps described in this section. In order to setup correctly, you need to add Audio tracks within Live. Each Audio track can then be routed to your preferred audio interface output. Configure the MP3244 /SQ4. Select "Audio CV" as "Format" on the "Output" section. 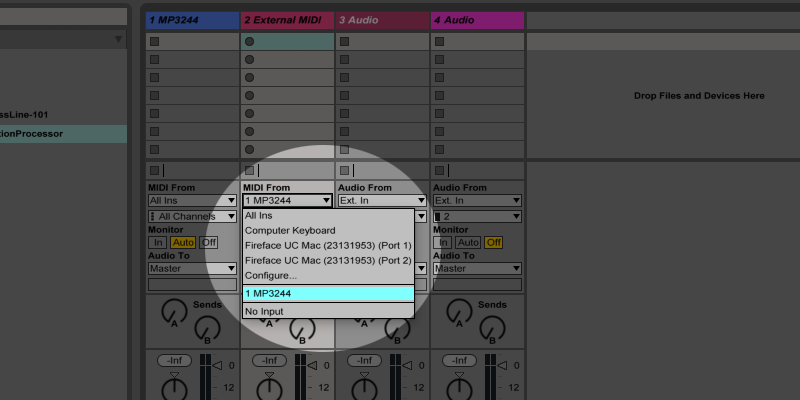 Set the "MIDI From" on the "External Instrument" track to the MP3244 / SQ4 track to receive MIDI messages for your external synth. All MIDI data (notes) that you record should be on the MP3244 /SQ4 Track. This is needed to trigger the Slope and Envelope Generators. Incase you want to trigger the "External Instrument" and the MP3244 / SQ4 separately, remove the connection and add MIDI events to each track independently.  Create and insert up to 4 additional Audio tracks into your Live setup. For each Audio track select the MP3244 / SQ4 track as the "Audio From" input. Than choose one of the MP3244 / SQ4 outputs. Repeat this step for all created Audio tracks. Select for each Audio channel a physical output ("Audio To"). The CV data will be sent to the selected physical output. If you want to use one physical output for two CV signals you can select for two Audio channels the same output and set the pan for one channel all the way Left and the other all the way Right. Make sure that you select "Monitor" > "In" or "Arm" the audio and "External Instrument" tracks in order to receive the CV and MIDI data from the MP3244 / SQ4 track. Congratulations, you're done! To modulate a software device, such as a synthesizer plug-in, please follow the steps described in this section. To modulate a software device, such as a synthesizer via MIDI CC, please follow the steps described in this section. Create a new "Instrument Track" for the MP3244 / SQ4. Configure the MP3244 /SQ4. 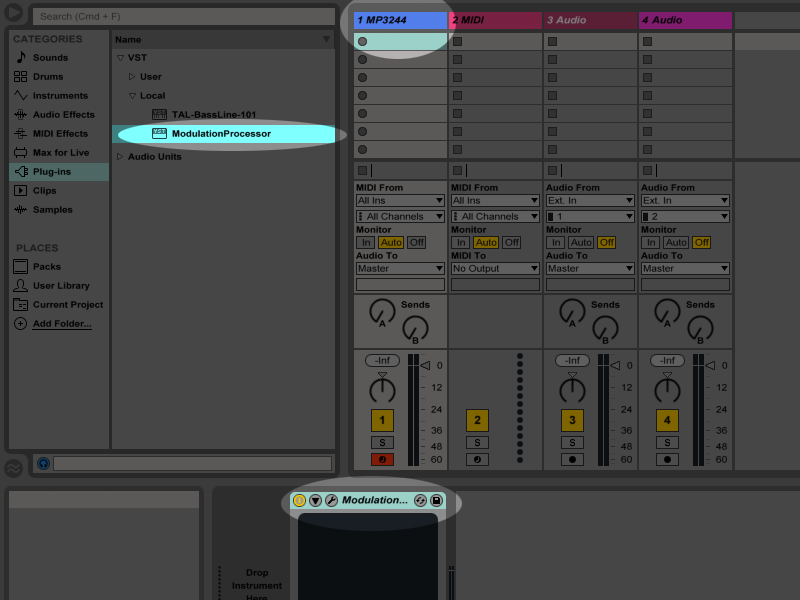 Select "MIDI To Host" on the "Output" section and make sure, that the Format is set to "MIDI CC". 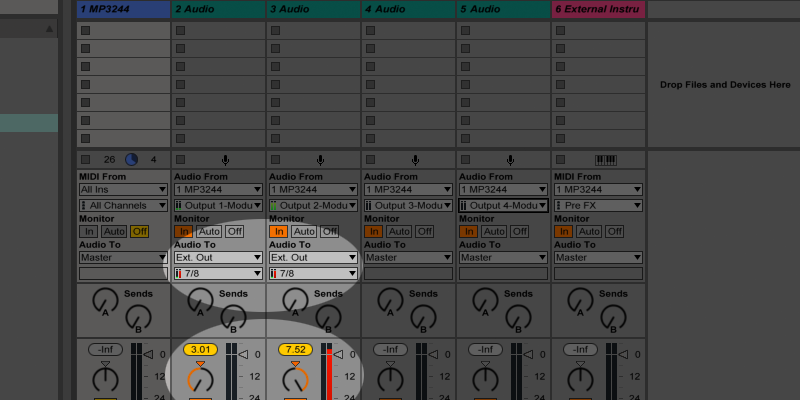 Create a second "Instrument Track" and add the software device, which you would like to control. On the "Instrument Track" set the MIDI input to the MP3244 / SQ4 MIDI output to receive MIDI messages for your internal synth. All MIDI data (notes) that you record should be on the MP3244 /SQ4 Track! This is needed to trigger the Slope and Envelope Generators. Within VCA1 select the Continuous Controller number you want to send. If your virtual synth has a MIDI learn function you can choose any number. 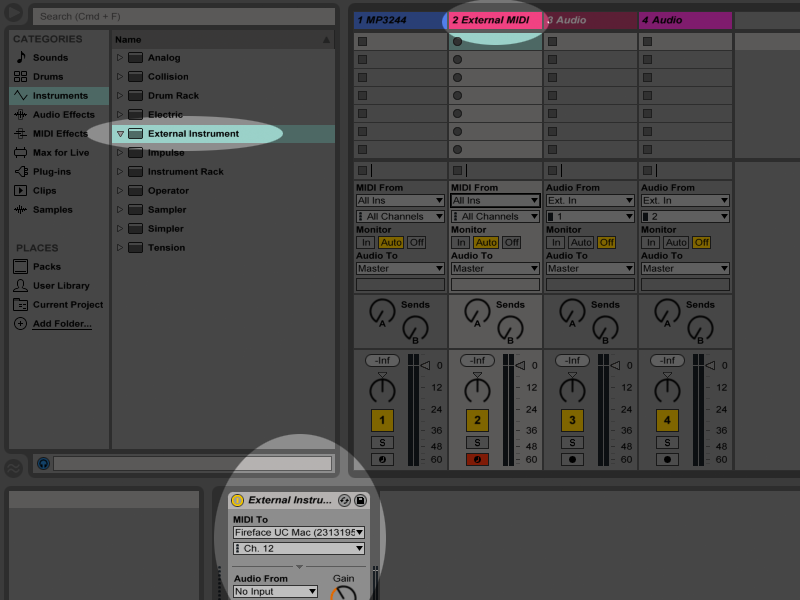 This only applies if your virtual synth has a MIDI learn function: enable MIDI learn and click on the desired parameter. Go to the MP3244 / SQ4 and “twittle” the VCA1 GAIN knob. The synth should now receive the CC messages. As soon you are finished, turn the MIDI learn function off. If your synth does not provide any MIDI learn function you need to grab the synth manual and see if and what MIDI CCs are available. To modulate the CC you need to select the specific CC number within the VCA1 of the MP3244 / SQ4. Make sure that you turn on the tracks "Monitor" functions. You are all set! 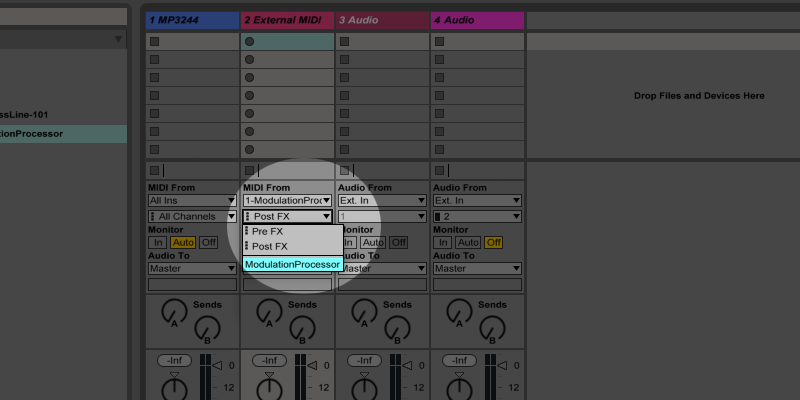 To modulate Live's native effects, please follow the steps described in this section. In order to send, and receive MIDI CC messages you need to first setup system wide virtual MIDI. If you do not have virtual MIDI ports, please check this Virtual MIDI Guide.